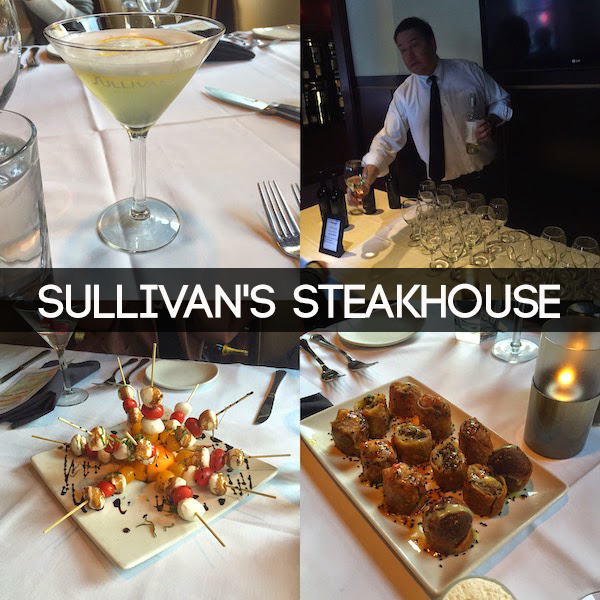 I had an amazing time checking out the new seasonal dishes earlier this week at Sullivan's Steakhouse! The restaurant was nice enough to invite the Windy City Blogger Collective over to experience some interactive cooking, mixology demos, wine tasting and a delicious dinner. We started off with cocktails and I have to say that the pineapple martini was probably the best martini I've ever had. After sampling a few drinks, out came the appetizers! I had never heard of a cheese steak egg roll before this night but I can now say that I am a fan! Though I enjoyed the egg roll, I'm not a huge red meat eater so I extremely excited about the fish options! The sea bass practically melts in your mouth. I also can't go without mentioning the super yummy mac n' cheese! Unfortunately, I had to miss dessert so that I wouldn't miss my train back home, (counting down until my Metra days are over) but the Instagram pics of the New York cheese cake and key lime pie made me so jealous! I had such a great experience and I will definitely be back at Sullivan's very soon! Click 'Read More' to view the current seasonal menu. Anyone else feeling a bit hungry after this post..?